The button accordion has many regional styles, from Ireland, France, Quebec, Louisiana, Texas and other places. We’ve focused on traditional American old time and bluegrass tunes, which are mostly played on string instruments, the fiddle in particular. Accordions are rare in these circles. Old time music is mostly played informally, at festivals and homes. Gathering with folk who share a common old time tune repertoire is one of the nicer ways to spend time. There are no music scores, tunes are learnt by ear, often on the fly. 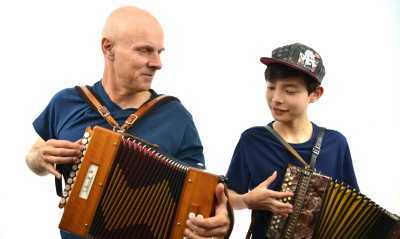 When our turn comes around we play these melodies together, with a “twin accordion” sound. Our instruments are powerful compared to those of our string playing companions, our task is to temper the sound to match the other players. A work in progress, we’re learning as we go.